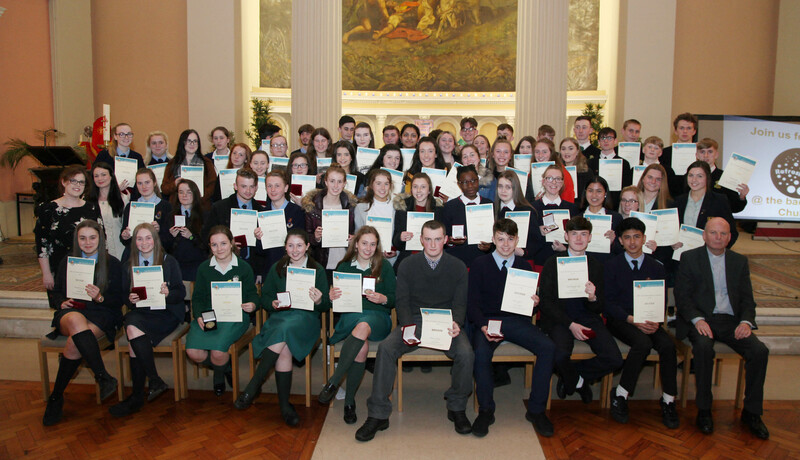 On Tuesday 24th April, the Archdiocese of Dublin congratulated 82 amazing young people who each received their Pope John Paul II Award. The awards are dedicated to the memory of St Pope John Paul II, who showed a great love and confidence in young people. Christian leadership and service in the community are at the heart of what the awards are about. The commitment and dedication from this year’s young people has been simply outstanding and has made them inspiring role models to those they serve in their parishes. We wish to congratulate all those who received awards on the night in St Paul’s Church, Arran Quay. We also wish to thank their leaders for their hard work to help those participating in the JPII Awards achieve their goals. Very Rev. Kieran McDermott, Episcopal Vicar for Evangelisation and Ecumenism, presented the awards to 82 young recipients from 12 parishes and schools working together throughout the diocese. 31 young people reached the accolade of the gold award, 15 reached the accolade of silver and 30 received the bronze award. Six young people received the Papal Cross Award. Eric Hughes was our guest speaker and musician for the ceremony, witnessing to his relationship with God and encouraging us not to compare ourselves to one another. Rather we need to realise that we are purposefully made with our own unique gifts to share – with God we are enough! On Tuesday evening the Archdiocese of Dublin held the annual Pope John Paul II Awards for young people from different schools & parishes. Pic: Award winners shown in St Paul’s Church, Arran Quay in Dublin.